HOAs Imagery Poems are Not Only about a Genre of Poetry! The HOAs Imagery Poems are not only about a genre of poetry, or a school, or a movement of poetry. 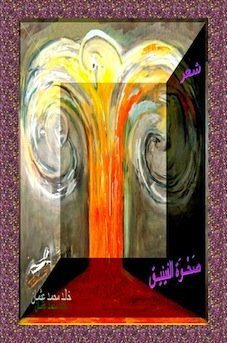 They are also about imaging poetry and poetising images, as you see all the way through the poetical page Arabic HOA, Bilingual HOA, Comment C2 Entries, HOAs Arabic Literature and HOAs Image Scripture. 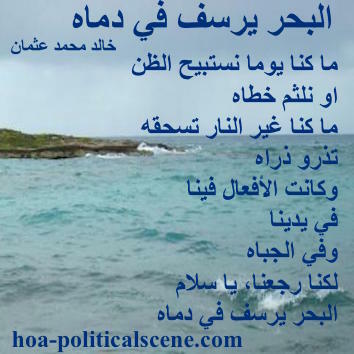 hoa-politicalscene.com - HOAs Imagery Poems: Couplet of poetry from "The Sun, the Sea, the Wedding", by poet and journalist Khalid Mohammed Osman on underwater view of blue sea. There is relevancy between many images and the snippets of poems on those images, as you see through this page and the other poems at HOA Calls, HOAs Animation Gallery, HOAs Design Gallery and HOAs Gallery. 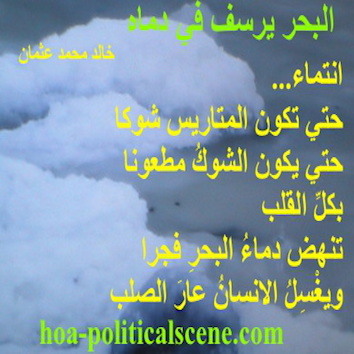 hoa-politicalscene.com - HOA's Imagery Poems: from "I Call You Samba, I Call You A Field", by poet and journalist Khalid Mohammed Osman on a river that ties ponds between people in the Horn of Africa. The imagery poems of HOA are all designed on beautiful images to trick out, after reading the snippets of imagery poems on HOA and use to beautify your walls at office, home, or any other workplace. 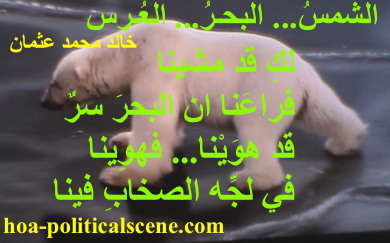 hoa-politicalscene.com - HOAs Imagery Poems: Couplet of poetry from "The Sun, the Sea, the Wedding", by poet and journalist Khalid Mohammed Osman on polar bear testing the melting ice. 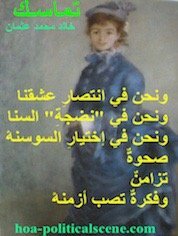 If you do have a website, you can take the posters of the imagery poems of HOA to post on your website. However, don't use many of them, so as not to affect your site listing on search engines. 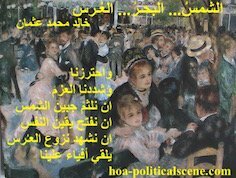 hoa-politicalscene.com - HOA's Imagery Poems: from "The Sun, the Sea, the Wedding", by poet Khalid Osman on Pierre Auguste Renoir's painting "La Grenouiller", 1869. Same poetry snippet, as above. Be reasonable, while posting few of these images and when you do, do provide alive and a "dofollow" link to this page at https://www.hoa-politicalscene.com/hoas-imagery-poems.html. 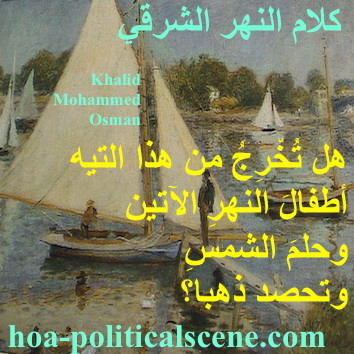 hoa-politicalscene.com - HOAs Imagery Poems: from "The Sun, the Sea, the Wedding", by poet & journalist Khalid Mohammed Osman on water passage, Venice, Italy. Same snippet of poetry, as above. View and read many imagery poems at HOAs Images, HOAs Literary Works, HOAs Literature, HOAs Love Poems, HOAs Photo Gallery and HOAs Picture Gallery to see other beautiful images to take as posters from those pages. 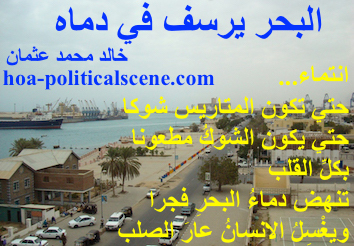 hoa-politicalscene.com - HOA's Imagery Poems: from "The Sun, the Sea, the Wedding", by poet and journalist Khalid Mohammed Osman on sea view. Same couplet of poetry, as above. The poetry on posters are also beautiful are HOAs Poems, HOAs Poetic Pictures, HOAs Poetry, HOAs Poetry Aesthetics, HOAs Poets Gallery and HOAs Political Poetry. Take what interests you from these poems to accessorize, embellish and beautify your place. 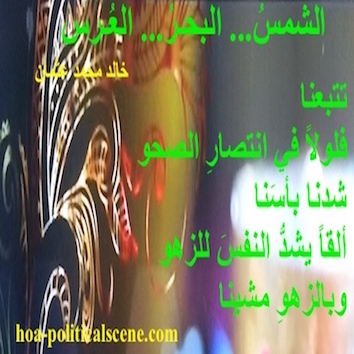 hoa-politicalscene.com - HOAs Imagery Poems: Couplet of poetry from "The Sun, the Sea, the Wedding", by poet and journalist Khalid Mohammed Osman on beautiful image. You have also some of those poetic images on iBooks to take free from the iTunes at the Rising Phoenix Picture Book, published by my daughter. RATE it when you do, please. hoa-politicalscene.com - HOA's Imagery Poems: from "The Sun, the Sea, the Wedding", by poet and journalist Khalid Osman on turquoise sea view between trees. Same poetry couplet, as above. More poetic images are on the literary section of the Horn Africas Network at the HOAs Cultural Project, where you read poetry, stories and essays. 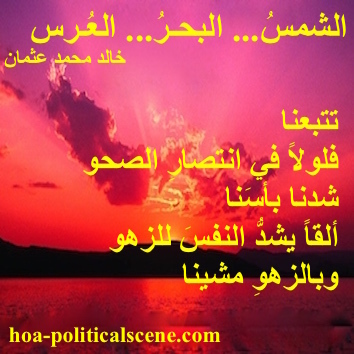 hoa-politicalscene.com - HOAs Imagery Poems: from "The Sun, the Sea, the Wedding", by poet Khalid Osman on the reflection of the sunset on the sky & the sea. Same couplet of poetry, as above. 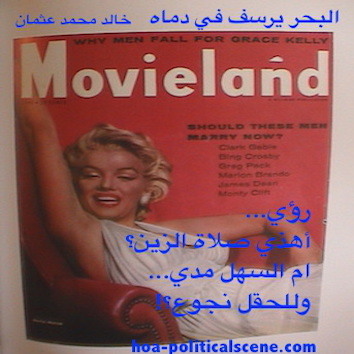 hoa-politicalscene.com - HOA's Imagery Poems: Couplet of poetry from "The Sea Fetters in Its Blood", by poet and journalist Khalid Mohammed Osman on Marilyn Monroe, Movieland cover girl. 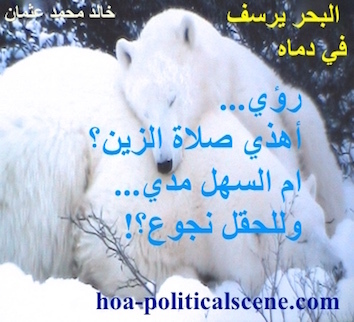 hoa-politicalscene.com - HOAs Imagery Poems: rom "The Sea Fetters in Its Blood", by poet and journalist Khalid Mohammed Osman on polar bears intimacy. Same, couplet of poetry, as above. hoa-politicalscene.com - HOA's Imagery Poems: from "The Sea Fetters in Its Blood", by poet & journalist Khalid Mohammed Osman on Skiathos, Sporades, Greece. Same snippet of poetry, as above. 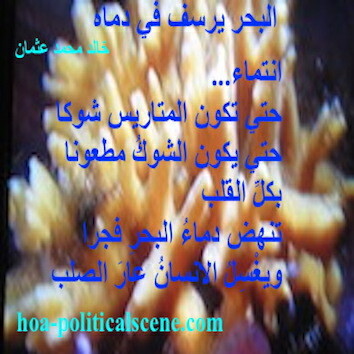 hoa-politicalscene.com - HOAs Imagery Poems: Couplet of poetry from "The Sea Fetters in Its Blood", by poet and journalist Khalid Mohammed Osman on coral reefs. hoa-politicalscene.com - HOA's Imagery Poems: from "The Sea Fetters in Its Blood", by poet and journalist Khalid Mohammed Osman on the Arctic Circle melting. Same, poetry couplet, as above. 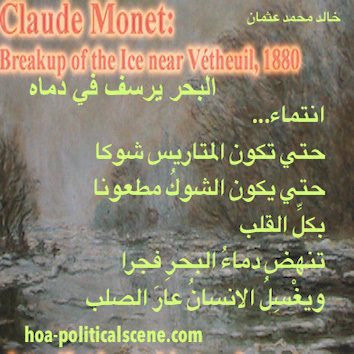 hoa-politicalscene.com - HOAs Imagery Poems: from "The Sea Fetters in Its Blood", by poet Khalid Osman on Claude Monet's "Breakup of the Ice, Vetheuil", 1880. Same poetry snippet, as above. 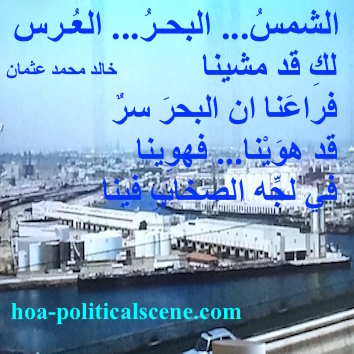 hoa-politicalscene.com - HOA's Imagery Poems: Couplet of poetry from "The Sea Fetters in Its Blood", by poet & journalist Khalid Mohammed Osman on Port Sudan. Same poetry couplet, as above. 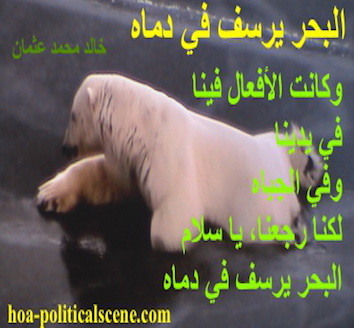 hoa-politicalscene.com - HOAs Imagery Poems: Couplet of poetry from "The Sea Fetters in Its Blood", by poet and journalist Khalid Mohammed Osman on polar bear getting out of the melting ice. 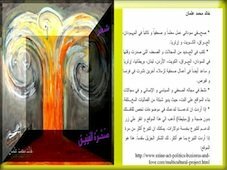 hoa-politicalscene.com - HOA's Imagery Poems: Couplet of poetry from "The Sea Fetters in Its Blood", by poet and journalist Khalid Mohammed Osman on beautiful design. 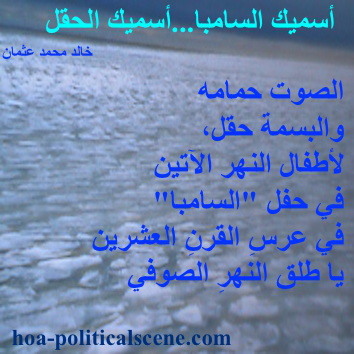 hoa-politicalscene.com - HOAs Imagery Poems: Couplet of poetry from "The Sea Fetters in Its Blood", by poet and journalist Khalid Mohammed Osman on beautiful blue image. 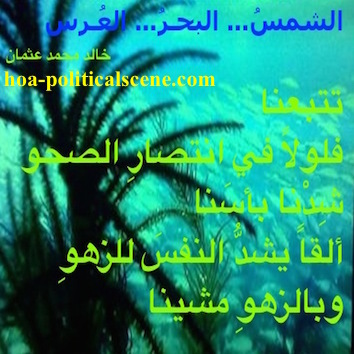 hoa-politicalscene.com - HOA's Imagery Poems: Couplet of poetry from "The Sea Fetters in Its Blood", by poet and journalist Khalid Mohammed Osman on the sea. 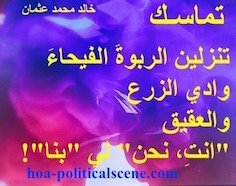 hoa-politicalscene.com - HOAs Imagery Poems: from "Speech of the Eastern River", by poet and journalist Khalid Mohammed Osman on greenery & bird species, Dinder & Rahad natural reserve, Sudan. 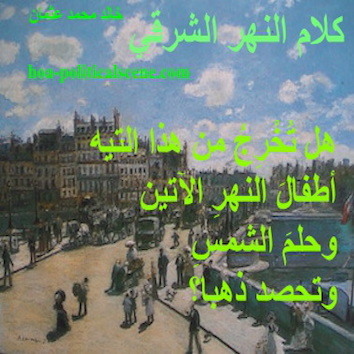 hoa-politicalscene.com - HOAs Imagery Poems: from "Speech of the Eastern River", by poet and journalist Khalid Mohammed Osman on Pierre Auguste Renoir's painting "Le Pont-Neuf", 1872.
hoa-politicalscene.com - HOAs Imagery Poems: Couplet of poetry from "Speech of the Eastern River", by poet & journalist Khalid Mohammed Osman on the Seine, Paris. Same poetry snippet, as above. 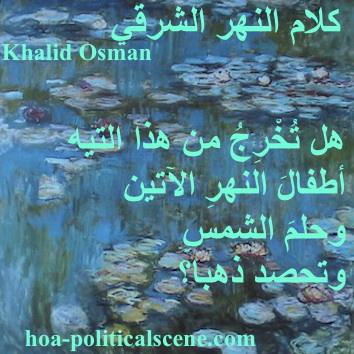 hoa-politicalscene.com - HOAs Imagery Poems: from "Speech of the Eastern River", by poet & journalist Khalid Mohammed Osman on Claude Monet's "Water Lilies". Same snippet of poetry, as above. 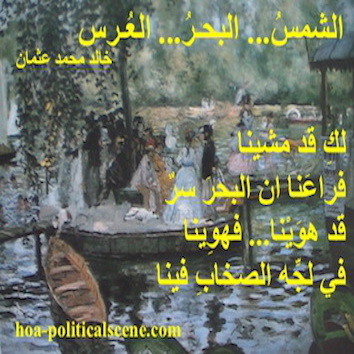 hoa-politicalscene.com - HOAs Imagery Poems: from "Speech of the Eastern River", by poet Khalid Osman on Pierre Auguste Renoir's "The Seine at Argenteuil", 1874. Same poetry couplet, as above. 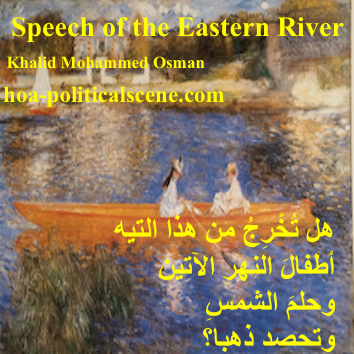 hoa-politicalscene.com - HOAs Imagery Poems: from "Speech of the Eastern River", by poet Khalid Osman on Pierre Auguste Renoir's "The Seine at Asnieres, 1879. Same snippet of poetry, as above. 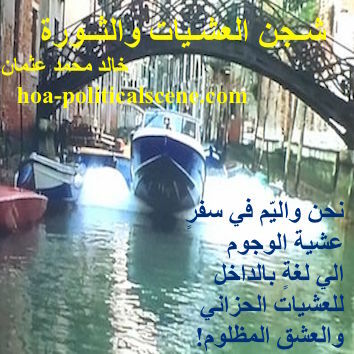 hoa-politicalscene.com - HOAs Imagery Poems: Couplet of poetry from "Revolutionary Evening Yearning", by poet and journalist Khalid Mohammed Osman on water passage, Venice, Italy. Want to say thank for the poetry on the images? Subscribe to the HOA Political Scene Newsletter. Share the page with your social media, or pin one of the images. Read the updates of the HOA Political Scene on your Yahoo, or subscribe to the HOA Political Scene Blog through one of the small buttons at the top of the left column. Like the HOAs Imagery poems, or tweet it, or forward it to your friends through the form on Forward HOA Political Scene. Use the comments form below to comment, or to write some of your literary works and get some useful gifts when you submit the form. Comments on the HOAs Imagery Poems, or new poems, or any literary piece of work submitted through this form appear at this section of the literary page below the comments form and above this paragraph.